Joanne White posted Sunday March 24, 2019. Bryan Mann got the win at Archerfield Speedway last night in round thirteen of the East Coast Logistics Sprintcar Series. It was a 35-lap affair that started with the top fourteen contenders inverted, courtesy of Dash winner Luke Oldfield and his acceptance of the BK Trading Challenge, and saw four different leaders over the course of the race, while Luke Oldfield made his way from fourteenth to ninth before a spin three laps in saw him relegated back to eighteenth. Oldfield was brilliant as he again made his way through field, this time climbing as high as second before a second spin ended his race just a couple of laps from home. Lachlan McHugh, who had started back in thirteenth after the inversion, challenged Mann for the lead but could not find a way through and was forced to settle for second while early leader Randy Morgan finished a very impressive third. Andrew Scheuerle and Brent Kratzmann rounded out the top five. Cody Maroske displaced Randy Morgan from the race lead at just before half race distance and led for around a dozen laps before he surrendered the lead to Bryan Mann. Unfortunately for Maroske contact between himself and the race leader a few laps later would leave him stranded in turn four and relegated the rear of the field. Maroske managed to climb back into thirteenth in the remaining three laps but a far cry from what was almost a podium finish just a few laps beforehand. Qualifying got underway and it was Luke Oldfield who again topped the qualifying order at the end of the time trial session. Oldfield stopped the clock at 11.722 seconds, with Bryan Mann (11.888) and Andrew Scheuerle (11.976) completing the top three. 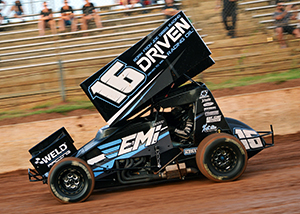 Kevin Titman (12.003) secured the fourth quickest time, while Aaron Kelly, in his Sprintcar racing debut, impressed with a 12.051 second lap to round out the fastest five. The top twenty-two drivers were separated by less than one second, while Paul Rooks beat Andrew Corbet by just 0.006 seconds, and Anthony Lambert was only three thousandths of a second quicker than Randy Morgan. Heat one got underway with Nelson Reddacliff and Anthony Lambert from the front row and while the pair raced side-by-side towards the first corner, it was Lambert on the high side who secured the lead. Paul Rooks, from position four, charged around the outside of Reddacliff, the duo two abreast as they rounded turn two, with Rooks soon securing the advantage and settling to second behind Lambert. Rooks set out after Lambert as the pair opened a small margin on the rest of the field, while Reddacliff started to come under pressure from Ben Hilder, Luke Oldfield and Peter Lack. Hilder had a massive look underneath Reddacliff as they raced out of turn two and down the back straight, but Reddacliff fought back hard on the high side as they rounded turn four and was able to maintain third. Oldfield began to challenge Hilder, relentlessly searching for a way through, while Reddacliff managed to pull a couple of car lengths ahead as he chased after the leaders. Oldfield eventually found his way ahead of Hilder and started closing in on Reddacliff, while Hilder was left to try and defend his position from Lack, but there was no stopping Anthony Lambert out in front as he raced to victory ahead of Paul Rooks and Nelson Reddacliff. Luke Oldfield finished third and led Ben Hilder, Peter Lack, Aaron Kelly, Peter Campbell and James Grady across the line. Kristy Bonsey and Randy Morgan led the field to the green for the start of heat two, and while Bonsey initially got the jump, Morgan was sensational on the high side, racing around the Q42 racer and into the lead as they navigated turn two. Bonsey settled into second ahead of Andrew Corbet, while Bryan Mann got around Cody Maroske and set his sights on Corbet. Maroske got back underneath Mann when Mann ran a fraction too wide in turn four, with Lachlan McHugh getting underneath Mann half a lap later. McHugh quickly turned his attention to Maroske, making his way underneath the Q22 racer before setting out after Bonsey, while Mann started looking for a way back past Maroske. Bonsey did a brilliant job in the Q42 racer, keeping McHugh at bay for a few laps before the Q23 racer slipped through on the inside and moved into third. Maroske and Mann had a great battle for the minor positions, each having a go at finding a way past Bonsey, only for Bonsey to refuse to surrender the position. Randy Morgan was absolutely unstoppable out in front, making everything look so easy as he raced to victory, but the battle for second intensified when Corbet made contact with the wall coming out of the final corner. Lachlan McHugh didnâ€™t hesitate and raced straight between Corbet and a lapped car, stealing second moments before crossing the line. Andrew Corbet officially finished third and led Kristy Bonsey, Bryan Mann, Cody Maroske, Kevin Britten, Trent Vardy and Geoff Davey across the line. Heat three saw Dave Whell and Allan Woods share the front row for the start, but it was pole-sitter Whell who got the best jump when the lights went green. Whell immediately secured the race lead, with Woods settling to second while Brent Kratzmann and Mitch Gowland negotiated over third. Kratzmann got around Gowland as they made their way through turn one, and while Gowland tried to get back underneath Kratzmann in turn two, he was not quite able to find a way though. Andrew Scheuerle and Kevin Titman quickly made their way past Gowland and set their sights on Kratzmann, the trio having their own intense battle as they tried to close the gap to Kratzmann. Kratzmann was starting to close in on Woods and Whell and it soon became a tight battle amongst the top five. Lapped traffic quickly came into play, and while Libby Ellis tried to find a way past Nathan McFarlane, the leaders closed in fast behind them. Ellis tried to get around the high side of McFarlane before switching to the bottom as they rounded turn four and having a big look on the inside of the NQ9 racer. Contact between Ellis and McFarlane followed, right in front of the leaders, with Whell, Woods, Kratzmann, Scheuerle and Titman all taking evasive action. McFarlane pulled to the infield while Scheuerle got underneath Kratzmann soon after. Dave Whell got the win ahead of Allan Woods and Andrew Scheuerle, while Kevin Titman got underneath Brent Kratzmann as they rounded the final corner. Kratzmann fought back on the inside as they raced side-by-side past the chequered flag, but was not quite able to regain the position, the Q2 racer forced to settle for fifth, just 0.041 seconds behind Titman. Brandon Haynes finished sixth and led Mitch Gowland, Des Collier and Libby Ellis across the line. Nathan McFarlane did not finish the race. Kristy Bonsey and Allan Woods shared the front row for the start of the fourth heat, and while they raced wheel-to-wheel into the first corner, it was Woods who emerged in front. Unfortunately the race was quickly brought under caution when Aaron Kelly and Peter Campbell came together at the rear of the field. Campbell was able restart the race however Kelly was pushed to the infield and unable to continue the event. A full restart followed and this time Bonsey got a brilliant start, quickly securing the race lead, with Woods settling to second and Dave Whell and Andrew Corbet negotiating over third. Paul Rooks and Luke Oldfield had a great battle for mid-field positions, as they closed in on the back of Whell, with Oldfield quickly securing the advantage over Rooks and beginning to challenge Whell. Oldfield spent a couple of laps searching high and low for a way past the Q4 racer, eventually getting through underneath Whell as they rounded turn three. Oldfield turned his attention to Corbet while Whell tried to defend his position from Rooks, only for Rooks to slip through underneath as they rounded turn one a few laps later. Oldfield quickly displaced both Corbet and Woods and started chasing down Bonsey and the race lead but there were not enough laps left to enable him to catch the Q42 racer. Kristy Bonsey got the win ahead of Luke Oldfield and Allan Woods, with Andrew Corbet home in fourth ahead of Paul Rooks, Dave Whell, Peter Campbell and James Grady. Aaron Kelly did not finish the race. Heat five started with Nelson Reddacliff from pole position with Mitch Gowland alongside and Randy Morgan and Peter Lack right behind them. Gowland got the jump when the lights went green and led the field through turn one, with Reddacliff in second but immediately under pressure from Lack. Andrew Scheuerle made his way underneath Morgan a couple of laps into the race, while Lack got underneath Reddacliff moments later. Lack set out after Gowland, leaving Reddacliff to try and defend his position from Scheuerle. Reddacliff held the current Australian Champion at bay for a couple of laps, denying Scheuerle when he had a look on the bottom as they rounded turn four, but was soon relegated back a position as Scheuerle switched to the high side and raced around the Q85 racer. Kevin Titman slid underneath Morgan and turned his attention to Reddacliff, and it was not long before the Q59 racer made his way around the high side of his rival to advance another position. Morgan searched high and low for a way around Reddacliff over the next few laps, patiently searching for the right way through before getting around the high side within sight of the chequered flag. Mitch Gowland managed to hold off a very chard-charging Peter Lack to get the win, with Lack home in second ahead of Andrew Scheuerle, Kevin Titman, Randy Morgan, Nelson Reddacliff, Kevin Britten, Trent Vardy and Geoff Davey. Ben Hilder and Cody Maroske led the sixth and final heat to the green, with Hilder taking control when the green flag flew. Maroske moved to the bottom and challenged Hilder for the lead, while behind them Brent Kratzmann had taken third but was trying to fend off a challenge by Anthony Lambert on the high side. Whilst Lambert got the better of Kratzmann, leaving Kratzmann with Lachlan McHugh on his tail, Hilder was able to maintain the advantage over Maroske. The battle between Kratzmann and McHugh began to heat up, with McHugh attempting to race underneath the Q2 racer a few laps into the race as the pair rounded turn two. Contact between the two soon followed, and continued down the back straight, while Bryan Mann did his best to avoid becoming involved. Kratzmann maintained the advantage and set out after Lambert, opening a small and short-lived margin on McHugh, and began to challenge Lambert for his position. Kratzmann raced around the outside of the Q90 car of Lambert, with McHugh following a lap later, and with some clean air in front of him it was only another couple of laps before McHugh was again challenging Kratzmann for track position. McHugh had a huge but unsuccessful look on the inside of Kratzmann as they rounded turn four, while out the front Ben Hilder soon brought the race to a stop when he spun in turn four, forfeiting the lead with just two laps left to run. Maroske inherited the lead and was unstoppable out in front, but it was the battle for second between Kratzmann and McHugh that captivated the crowd. McHugh took to the high line, relentlessly searching for a way around Kratzmann, occasionally getting his nose in front, only for Kratzmann to fire back on the low line. McHugh switched to the low side as the pair drag-raced side-by-side out of the final corner but could not quite get ahead of Kratzmann before the line. Further contact between the pair followed after the chequered flag. Cody Maroske got the win, oblivious to the drama unfolding behind him, with Brent Kratzmann second head of Lachlan McHugh and Bryan Mann. Anthony Lambert finished fifth and led Nathan McFarlane, Des Collier, Ben Hilder, Libby Ellis and Brandon Haynes across the line. The Dash event started with Luke Oldfield and Lachlan McHugh from the front row with Oldfield quickly taking control when the lights went green. McHugh settled into second ahead of Andrew Corbet and Bryan Mann, with Mann soon surrendering a position to Peter Lack when he got a little too high in turn two. Lack started challenging Corbet for third, with both Mann and Andrew Scheuerle closing in fast. Luke Oldfield got the win, and, when offered the BK Trading Challenge, accepted the challenge and inverted the top fourteen starters in the A-Main and added five laps to the race distance. Lachlan McHugh finished second in the Dash ahead of Andrew Corbet, Peter Lack, Bryan Mann, Andrew Scheuerle, Kevin Titman and Paul Rooks. Kristy Bonsey started the B-Main from pole position with Dave Whell alongside and Aaron Kelly and Ben Hilder right behind. While Bonsey and Whell raced wheel-to-wheel towards the first corner, it was Bonsey who secured the lead, leaving Whell in second while Hilder and Kelly negotiated over third. Hilder soon got the better of Kelly and began challenging Whell for second, while Nelson Reddacliff and Trent Vardy negotiated over mid-field positions until Vardy spun the Q55 racer and brought the race under caution. Bonsey led the restart from Whell and Hilder and while Kelly began challenging Whell for position, he soon came under pressure from Reddacliff. Unfortunately the race was soon brought back under caution with Geoff Davey spun in turn one and Aaron Kelly spun in turn four. Bonsey again led the restart from Whell and Hilder with Reddacliff now in fourth but under increasing pressure from Kevin Britten. Britten was relentless as he searched for a way past Reddacliff, the pair fighting for the final transfer to the A-Main, with Britten eventually getting under Reddacliff as they rounded turn two. At the front of the field though Hilder was holding nothing back as he challenged Bonsey for control of the race, but Bonsey was in spectacular form and successfully defended her position every time Hilder tried to take it from her. Both Bonsey and Hilder put on a brilliant performance, giving each other racing room but unwilling resign themselves to second without a fight. Vardy had a second spin and brought the race to another stop, and was relegated to the infield for the rest of the race. Another stoppage followed soon after, for Geoff Davey in turn one but it was Kristy Bonsey who went on to take the win, withstanding enormous pressure from Ben Hilder in the final few laps of the race, with Hilder forced to settle for second. Dave Whell finished third while Kevin Britten crossed the line in fourth to secure the final transfer to the A-Main. Nelson Reddacliff finished fifth and led Brandon Haynes, Peter Campbell, Nathan McFarlane, Des Collier, Libby Ellis and James Grady across the line. Geoff Davey, Trent Vardy and Aaron Kelly all failed to finish the event. With the top fourteen starters inverted for the start of the A-Main it was Allan Woods and Randy Morgan sharing the front row and leading the field to the green. Woods got the jump on the start and lead them through turn one, but Morgan powered around the high side and quickly took control of the race leaving Woods in second ahead of Cody Maroske and Anthony Lambert. Luke Oldfield took to the high line and began making his way forward, advancing to ninth on the first lap, while Kevin Titman and Bryan Mann searched for a way past Mitch Gowland. Andrew Scheuerle and Lachlan McHugh had a great battle deep in the field, racing either side of Paul Rooks as they rounded turns one and two, with McHugh momentarily getting ahead of Scheuerle. Just three laps in and Oldfield spun to a stop on the main straight, surrendering all the positions he had just gained, and a few more on top of that. Oldfield took to the restart from position eighteen, with thirty-two laps still to run. Randy Morgan led the restart from Allan Woods, Cody Maroske, Anthony Lambert, Bryan Mann and Brent Kratzmann. While Luke Oldfield started to make up lost ground, Lachlan McHugh and Andrew Scheuerle resumed their battle mid-field until Scheuerle pulled away and found a way past Mitch Gowland, leaving McHugh to contend with Paul Rooks and a hard-charging Ben Hilder on his tail. McHugh soon caught and found a way past Gowland and set out after Scheuerle, while Hilder and Rooks ran side-by-side for several laps, each searching for a way past Gowland. Scheuerle had the A1 car set up beautifully, making his way ahead of both Kevin Titman and Brent Kratzmann, while deep in the field Rooks managed to get the better of Hilder, only to have Peter Lack come though, displace Hilder and start challenging Rooks in the Q96 racer. Hilder fought back on the bottom and got back underneath Lack, as Oldfield continued to make his way forward. Hilder again took the high side, running two abreast with Rooks for a couple of laps before eventually managing to secure the advantage, with Oldfield following soon after. Andrew Corbet and Peter Lack traded places behind Rooks, whilst both searched for a way past, while Oldfield made his way ahead of Mitch Gowland before turning his attention to Hilder. At the front of the field the leaders had entered lapped traffic, the back markers giving Cody Maroske the opportunity to pounce. Maroske displaced both Woods and Morgan to take control of the race just before they hit half-race distance. Bryan Mann began challenging Woods, while Peter Lack continued to search for a way past Paul Rooks. Brent Kratzmann looped the Q2 racer in turn four but was able to keep the car moving, rejoining the race but loosing a few positions in the process. Lack finally made his way underneath Rooks, but contact between Rooks and Corbet a lap later brought the race under caution with eleven laps left to run. Unfortunately Rooks was unable to continue and did not take to the restart. Cody Maroske led the restart from Randy Morgan and Bryan Mann, with Andrew Scheuerle and Lachlan McHugh close behind and Luke Oldfield up to eighth. Mann challenged Morgan for second, while McHugh took to the high side in an effort to get around Scheuerle. Brent Kratzmann got underneath Ben Hilder and began searching for a way past Oldfield, while Oldfield held nothing back as they tried to find a way past Allan Woods. Oldfield got underneath Woods before getting around Anthony Lambert a lap later, while at the front of the field the battle for the race lead between Maroske and Mann was starting to heat up. Mann was absolutely brilliant on the high side and, despite the best efforts of Maroske, Mann soon emerged in front and took control of the race. Oldfield continued to advance, making his way past Randy Morgan and started closing in on Maroske and McHugh, who were now negotiating over second. A small mistake by Mann in turn four saw his lead disappear with Maroske and McHugh closing in fast, but contact between Mann and Maroske would end with Maroske stranded on the track coming out of turn four. Maroske restarted at the rear of the field but his chance of a podium result was gone. Bryan Mann led the restart from Lachlan McHugh and Luke Oldfield with just three laps left to run. Oldfield was determined and immediately put the challenge to McHugh, sliding underneath the Q23 racer as they rounded turn three and moving into second. McHugh fired straight back xon the inside as they raced out of turn four, successfully regaining second, only for Oldfield to spin to a stop in turn two with two laps left to run. As per the rule book Oldfield was relegated to the infield and would not be able to finish the event. Bryan Mann went on to take a very popular win, with Lachlan McHugh home in second and Randy Morgan filling the final podium position. Andrew Scheuerle finished fourth with Brent Kratzmann home in fifth. Anthony Lambert finished sixth, while Ben Hilder crossed the line in seventh, after transferring from the B-Main. Alan Woods, Peter Lack and Kevin Titman rounded out the top ten, leading Kevin Britten, Andrew Corbet, Cody Maroske, Kristy Bonsey, Mitch Gowland and Dave Whell to the chequered flag. Luke Oldfield and Paul Rooks did not finish the event. Sprintcars Queensland are set to return to Fraser Shores Maryborough Speedway next Saturday night for another big night of Sprintcar racing. Come and join us at Maryborough Speedway next weekend, bring a few friends, and enjoy a great night of family-friendly entertainment.